Skypoint WordPress Theme for Real Estate Industry! Home » Skypoint WordPress Theme for Real Estate Industry! Skypoint is a fresh and responsive WordPress Theme from ThemeFuse developer club. This theme is specially designed to use for real estate industry to showcase their services. Generally, it could be used for any kind of professional real estate owners, realtor business people and property rental agency to showcase renting homes/flats/apartments/properties. 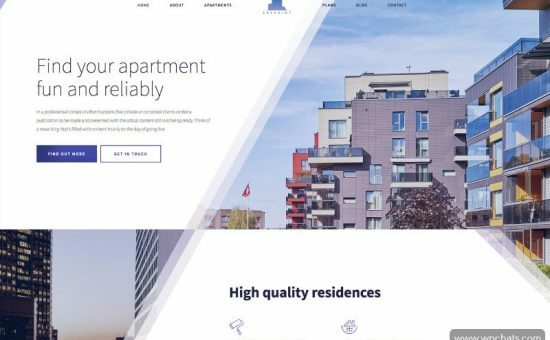 Skypoint WordPress Theme would be one of the best visual affected real estate WordPress themes out there since it was created to use for real estate industry it comes with all necessary features to showcase the services, properties, flats and etc. The skypoint theme is very responsive and modern WordPress theme that support to work on all smartphones and browsers. Skypoint WordPress Theme has been created with the visual engagement of your business which will attract your visitors to stay and surf on your website. The design will defiantly solve your purpose of showcase the real estate projects and rent properties. It has been built with advanced drag and drops visual page builder that helps you to build a unique and outstanding website design for your clients/customers. Some of the real estate widgets features included, such as real estate sliding on homepage with features images and short info which can be edited in the Layer Slider & Revolution Slider (6 versions which we designed for you to use) + 2 Premium Options), unlimited coloring options, clean and customizable web layout to display the properties with dedicated real estate pages, display offer prices pages, drag and drop visual page builder to build unlimited pages with call to action, landing page, Internet marketing pages and many more. Skypoint Theme has built dedicated property page that allows you to display the detailed property information with custom categories. You can add anything that related to property websites. For example, Penthouse, Luxurious, Classic and Duplex, custom contact form to receive an inquiry about properties and etc. Additionally, you will find awesome real estate Icons to showcase different services as well. Theme installation documentation and guide!